A black and white negative of fields in Whitby looking north. 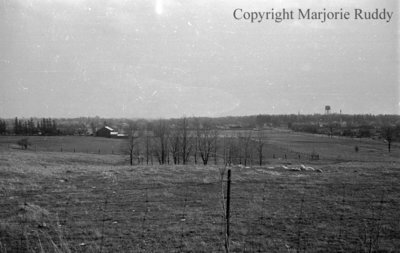 In this view the Kinsmen Water Tower is visible on the right side of the photograph. The water tower was built at the north-west corner of Kinsmen Park at Centre and Chestnut Streets in 1947. It was demolished in 1979. View of Whitby Looking North, c.1947, Marjorie Ruddy. Whitby Archives A2013_040_837H.